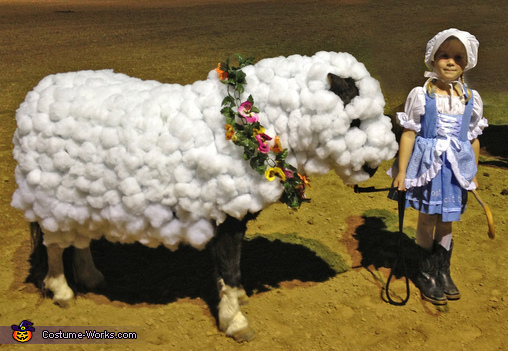 Olivia is playing the role of Lil' Bo Peep and her trusty (and very tolerable) pony, Fuzz Buster, is playing the role of the sheep. It took me approx. three days of working on and off to complete this costume. The pony's costume: I started off by purchasing "sleazy sleep wear" for horses online for $20. That covered the base for his head to shoulders. I purchased three bags of poly fill from Walmart for $3.67 each. I formed big cotton balls and used hot glue to adhere them to the sleazy hood. For the back portion I purchased a cheap fleece blanket for $3 and did the same, adhering the cotton to the blanket with hot glue. Olivia's costume was purchased from an individual for $8, however the bonnet was hand made for around $5 in material. The bamboo staff, hand made by my great great uncle and passed down to me, completed the look.